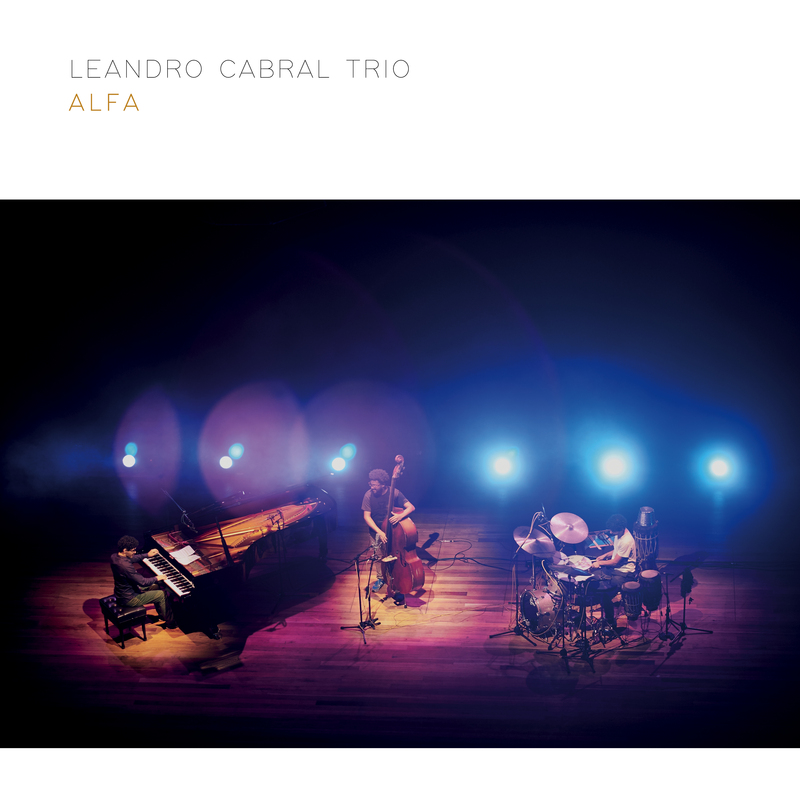 There are many moments on Alfa by the Leandro Cabral Trio when you just might feel that Glenn Gould has come to life, incarnated as a Brasilian pianist named Leandro Cabral. The pianist can play notes by caressing them as if his fingers were bird feathers. Then on a dime he can turn into a force of nature in a samba band, but never ever going at the keyboard with hammer and tong. Cabral’s incredible use of dynamics going from pp to literally gliding and flying on the wings of the wind, on air full of bliss with glorious, gleaming arpeggios that might just as soon come to a stop; then plunging downward his music bathes his native mountains and the sertão in the rhythm of light. Samba turns into the proverbial, feverish frevo; rollicking “Rapaz de ben” to star-bright “O grande azul”… as if piano morphed into sforzando in the grand Brasilian manner. So is Leandro Cabral a classical pianist in a Brasilian garb? He is both really; a changeling – a bit like Keith Jarrett but without the wall that separates classical from Brasilian forms melded into Jazz-style improvisation. Cabral’s lines between the two (or three) styles is so blurred that it is almost impossible to catch him inhabiting one metaphor. Perhaps the pianist’s mastery of yoga has something to do with the extreme fluidity of his playing with notes curving in the air, held steady only by the semi-percussive “ghost notes” rumbling into the basslines, to add to the Brasilian rhythmic feel by Sidiel Vieira, whose undulating vibrato-inflected pizzicato recalls the legendary Paulista, Zeca Assumpção, while the percussion colourist, Vitor Cabral’s drumsticks magically transform into moistened paint brushes dripping with rust and gold as the drummer spreads swirling patterns onto the musical canvas. Both “Marcela” and Antonio Carlos Jobim’s iconic piece “Inútil Paisagem” are masterful examples of the interplay between the members of the trio, the latter piece slowed down to an aching elegy by Leandro Cabral. Both “O Amor Que Se Deu (Vassi nº 2)” and “Rute E Sua Grandeza (Vassi Nº 1)” are breathtaking high-wire acts for the pianist and “A Dança” which features the silken-voiced Vanessa Moreno and the sublime exclamations of Cássio Ferreira’s soprano saxophone give a sense of musical storytelling that underpins the trio’s playing and everyone together creates a magical world which draws you in. The rest of the repertoire is as singularly flawless, poised and glassily perfect. Clearly Leandro Cabral, Sidiel Vieira and Vitor Cabral are on the same page and what lingers here isn’t so much their individual qualities – Leandro Cabral’s gentle, poetic manner and tiny portamentos, or the endlessly nuanced shades of black that both Vieira and Vitor Cabral find for harmonic and rhythmic colours as they respond to each other and to Leandro Cabral, echoing phrasings, pushing each other forwards and exchanging whispered secrets that only the music reveals. This is a lovely disc, and also a wonderful example of what a trio can achieve; three passionate musicians becoming so much more than the sum of their parts. Track List: 1. O Amor Que Se Deu (Vassi nº 2); 2. Outra Vez; 3. Rapaz De Bem; 4. Rute E Sua Grandeza (Vassi Nº 1); 5. A Dança; 6. O Grande Azul; 7. Valsa Do Amanhã; 8. Alfa; 9: Marcela; 10. Inútil Paisagem. Personnel: Leandro Cabral: piano; Sidiel Vieira: contrabass; Vitor Cabral: drums and percussion; Vanessa Moreno: vocal (5); Cássio Ferreira: soprano saxophone (5).